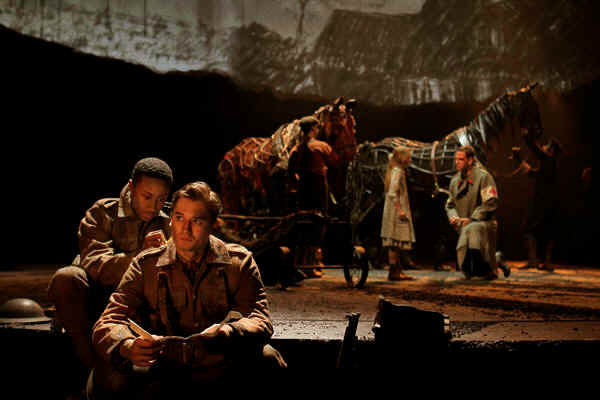 As a play, “War Horse” is true to its source material. Michael Morpurgo’s 1982 children’s novel tells the story of the first World War from the point of view of a horse raised on a farm, sold to the British cavalry, and then captured by Germans and used to pull ambulances and weapons before being reunited with the boy who raised and loved him. Nick Stafford’s adaptation has all the dutiful historical information and heart-tugging sentimentality you would expect from an adventure novel aimed at young adults, the kind that Steven Spielberg would want to make a movie of (which is indeed in the works). As a theater piece, “War Horse” – which premiered at the National Theatre of Great Britain and has now been remounted by Lincoln Center Theater in New York -- is all about the extraordinary animal puppets created by two South African designers, Adrian Kohler and Basil Jones. Each of the four horses requires three technicians to operate it: two inside the body and one outside manipulating the head. They’re beautiful to behold and somewhat miraculous in action. It is the essence of theater art to watch inanimate objects come to life in front of your eyes while every bit of the illusion-making machinery remains visible. The horse we get to know the best, so to speak, is Joey, first seen as a feisty foal up for auction and bought by a drunken farmer in a foolish attempt to compete with his brother. The farmer’s son Billy becomes attached to Joey, a hunter by breeding but forced by circumstances to become a plowhorse. Billy’s training is the set-up for us to watch the puppeteers work their magic, as Joey the foal gives way to full-grown Joey running, jumping, now skittish, now tame, the puppeteers supplying the horse’s sounds and its breathing movements. Marvelous! These aren’t symbolic animals represented by Greek-theater masks and kothurni a la “Equus.” They’re more like the inventive animal puppets in “The Lion King,” sculptural objects with ingenious moving parts, though more realistic and less stylized. Kohler and Jones, whose Handspring Puppet Company bases a lot of its design work on traditional African puppetry (specifically from Mali), have collaborated extensively with South African artist William Kentridge. And the theatrical style of “War Horse” (directed by Marianne Elliott and Tom Morris) bears some resemblance to Kentridge’s work in its use of not only puppets but film animation that relies heavily on simple charcoal drawings projected onto an irregularly shaped screen that floats across the wide proscenium of the Vivian Beaumont Theater. The play employs a large cast, 39 actors, many of whom also sing and create scenery, story-theater style. Among them, Boris McGiver distinguishes himself as Billy’s hapless father, as do Alyssa Bresnahan as his long-suffering wife Rose (she has an unusually strong, commanding voice for a small woman) and handsome Peter Hermann in the Good German role. But of course the performers who carry the show are the 12 puppeteers who turn chunks of wood and fabric into living, breathing horses.